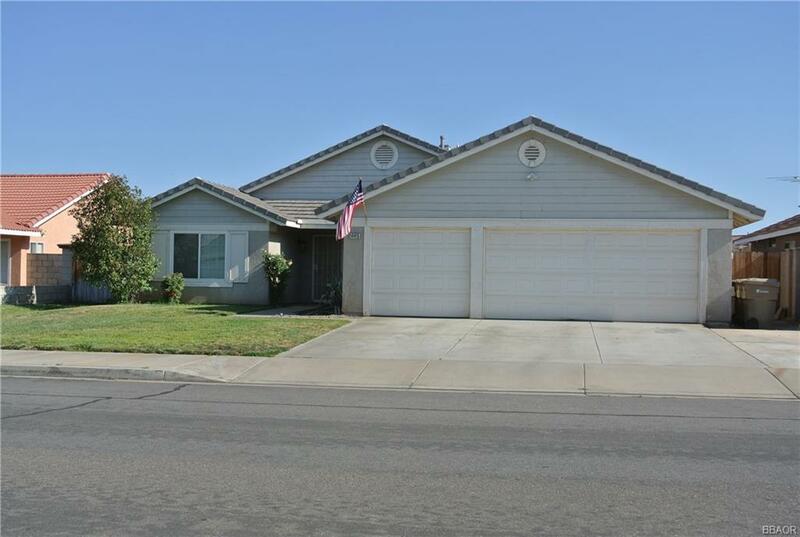 Wonderful Hesperia area located near Maple Park, Hesperia High School and Cottonwood Elementary School. This home boasts 4 bedrooms, 2 Bathrooms, 3 Car Garage with 220v outlet and 1,863 square feet of living space with an open floor plan and two living rooms. Large Master Suite flaunting a walk-in closet, garden bathtub, separate shower and enclosed toilet. All windows, slider door and air conditioning unit are three years new along with a Solar System large enough to handle future upgrades of a pool or spa if desired. Current home owner disclosed electric bills of $8.00 to $10.00 per month. Ceiling fans in every room, LED canned lighting and dimmer switches throughout the home for energy efficiency. Large gate access to side yard for boat storage. Automatic sprinkler system, storage shed, dog run and block wall on three sides with a raised planter gardening area on the back wall. Buyer must qualify and or assume current solar loan in the amount of $32,000 amortized over 30 years.